Hit the slopes with your whole clan of snowbunnies—even your pet can suit-up and join you in the snow! You might not be destined for the Winter Olympics, but when you hit the slopes with your family, the event inspires some fanfare. 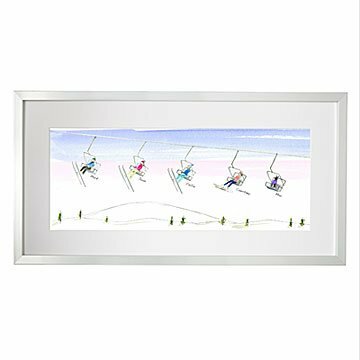 Showcase your mountain crew with Patricia Carlin's charming personalized ski and snowboard artwork. A colorful cast of 2-14 characters custom designed to look like your family takes to the slopes in a chairlift line-up. Choose skis or snowboards for each family member, and skin tone and hair color to match your crew—even your family pet can suit-up and join you in the snow! Designed in Pennsylvania. Printed and framed in Oregon. Click to view full menu of character and color options. For more family scenes, check out our Personalized Family Tandem Bike Art and our Personalized Family Canoe Art. Have 2 sons and they are already fighting as to who will inherit the picture when we die :)). Will be ordering another picture to stop the fighting!! It is a unique and lovely piece of personalized art. It looks very nice in the main floor hallway of our home. I would buy this item again! My kids wanted the prefect gift for their dad! We all decided, this was it. They all had fun making it their own! My husband was so happy with it!!! My only complaint is that the draft I was sent was too small to see. Final product turned out excellent. Mom loves it. Perfect gift for NH ski family. They will love it! I only wish that the third skier was a child, as I had asked. Perhaps this was not an option. This is a fun and unique way to say thank you to a family or Happy Holidays, for me it has mostly been for house warming gifts.